Some of my plants near the bottom of the tank are dying. I’m pretty sure it’s due to lack of light. They make it much easier to mount pots at different levels. This would leave your floor free for a laying bin. Build a frame around the cage, or try dragon ledges, or the planter idea. those crotons need a lot of light. I'd suggest a jungle dawn spot bulb if you got a spare $60 or so... they can grow the ground cover out no problem. 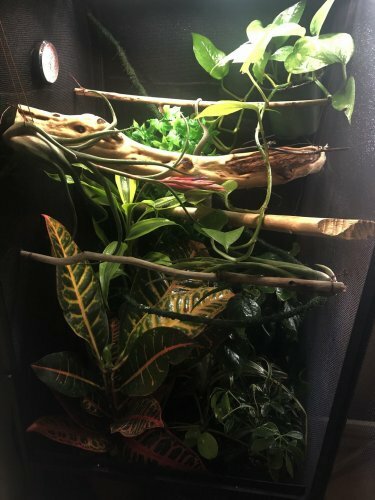 I use branches anchored to sides as make shift (read: cheapo) dragon ledges. Then i ziptie plants to them. I can't compare the two, but so far happy with the Sansi. Sorta wishing I bumped up to the 40w for the Atriums, but the 30w still reaches the bottom. I was worried they'd be too bright but the chams like being under them. I think there was a coupon on Amazon when I ordered. @snitz427 so just looked them up, the 36w is $40, looks legit! Thanks for the help! I was able to get two plants off the ground and raised into the corners of the tank. (Chinese money plant, and the snake plant). 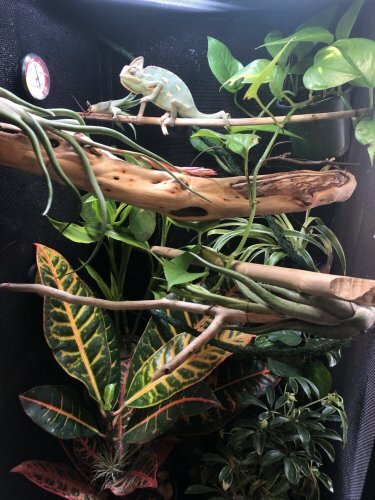 Officially have no more fake plants in my enclosure!